What Is HALT (Highly Accelerated Life Testing) And Why Perform HALT? What Is A Typical HALT Procedure? What Equipment Is Used For HALT? What Kind Of Failures Occur During HALT? A Proof of Screen (POS) (sometimes called Safety of Screen) must be used to validate the HASS to prove that sufficient life is left for a normal use lifetime. During HASS, stresses may be higher than normal operation to precipitate defects in a short amount of time, however the stresses are within the capability of the design as proven by the HALT. HASS stresses are also typically more aggressive than those used in traditional Environmental Stress Screening (ESS) which makes HASS a more efficient screen than ESS. HASS screens are typically an hour to a few hours whereas ESS screens may take a day to a few days. The types of stresses used for HASS are similar to those used in HALT. HASS uses combined temperature cycling, random vibration and electrical loading/monitoring. HASS screens are performed in the same type of chamber that is used for HALT. The vibration in HASS is randomly applied over a broad frequency range producing energy to 10,000 Hz in 6 degrees of freedom. What is a Typical HASS Profile? A typical HASS profile used by DES is shown in Figure 1. The first part of the HASS profile (0 to ≈ 40 minutes) is a precipitation screen used to precipitate latent defects. The precipitation screen consists of high levels of steady vibration and temperature rate of changes of approximately 40 – 60 °C/minute. The second part of the HASS profile (40 – 75 minutes) is a detection screen used to detect precipitated defects. The detection screen consists of lower levels of modulated vibration and slower temperature rate of changes of approximately 5 – 10 °C/minute. It is sometimes easier to find intermittent defects during the detection screen because the stress levels are lower and the temperature rate of change is slower. What are the Benefits of HASS? Overall product quality and manufacturing process control are improved when using HASS. Reliable products lead to happy customers. Happy customers lead to increased profits/market share! 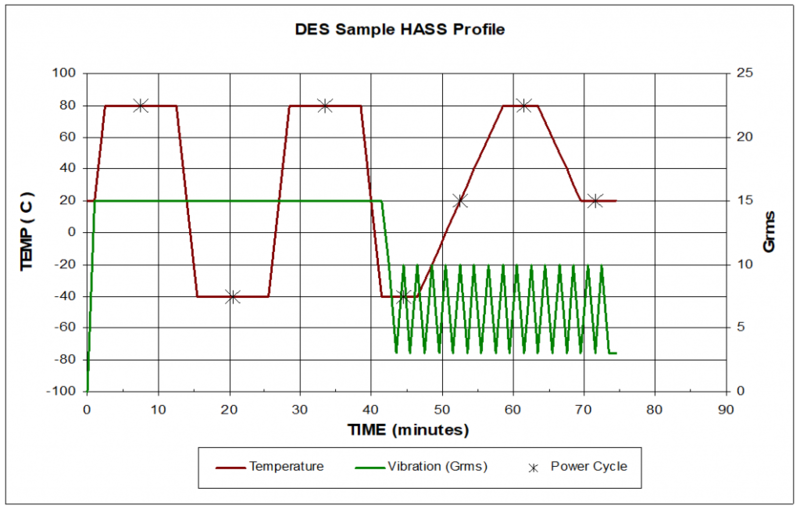 DES has more than 20 years of experience performing HALT/HASS testing on a variety of medical, commercial, industrial and military products. For more information on HASS, HALT or other testing services, contact DES or call 610.253.6637. This entry was posted in HALT & HASS and tagged hass testing by DES. Bookmark the permalink.